Proportional mixers are commonly used for glory holes, but can also be used for furnaces and garages when available gas pressure is too low for other burners. 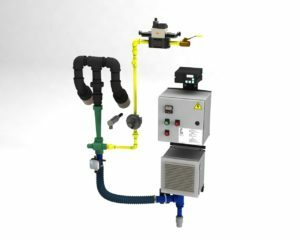 They will efficiently mix any commercially available fuel gas from 4“w.c. to 1 psi with air from 4“w.c. to 4 psi. When used with a zero governor, the volume of the air/gas mixture is regulated by a butterfly valve and the ratio of air to gas is maintained throughout the firing range.